A majority of the most popular essential oils are distilled using the process of steam distillation. Producing essential oils can be a complicated process for the novice or the beginner. It is not recommended because of the amount of money one would need to spend on equipment and the tremendous amount of plant material needed to produce even a small amount of oil. There are other methods of extraction such as cold extraction and dry distillation, but they are not the most common ones. These are the only ways known to produce what is called essential oil. We sometimes read that solvent and supercritical CO2 extractions are used to produce essential oils. Both methods are very effective for extracting essential oils from plants, but they also extract waxes and resins. The resulting products are more like a paste or thick honey and are called concrete or absolute. 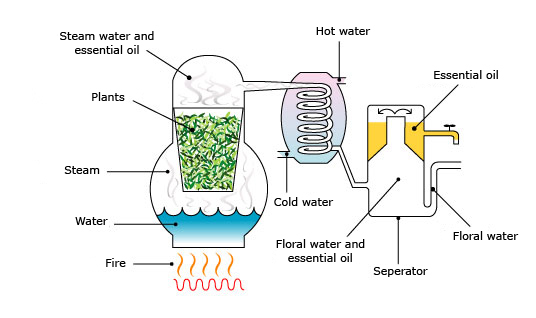 One of the two first things to do, the other being to gather large amounts of the plant material you want to make the essential oil from, is to assemble a distillation apparatus. 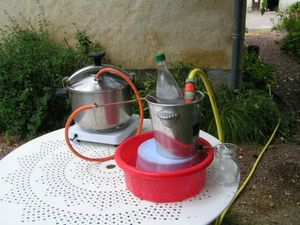 A still built for the specific purpose of distilling essential oils can be bought for a few hundred dollars, or any intrepid individual can build their own still to their own unique specifications. To build your own still you’ll need to determine how much productivity you envision to determine the still’s size. Large, medium or small, the first step in the way forward is a plan for the still’s construction and perhaps knowledge of assembling metals such as sheet metal. You will need to make what is called a retort, which is big enough to hold the water to heat into steam, and above the water on a grate, the plant material for the steam to vaporize the plant material’s volatile compounds. Perhaps purchasing the tubing necessary for the condensation process is better than trying to make your own (since glass tubing is what you should aim for), but that’s entirely an individual choice. You will need another tank containing cold water for the tubing to allow the steam to condense into hydrosol (more about that later), and a separator to separate the oil from the water vapor. Once the oil has been separated it will need to be collected into a large jar, vessel or other receptacle to be stored so that the oil can be dispensed into your containers of choice at the end of the process. Another major decision will be what to use to heat the water. Obviously that depends on what you have available to you. If you live near a forest or have a wooded area on your property—or access (legal, of course) to a wooded area—building a fire may be the best (most economical) choice. If you do not live outside a city with access to firewood, then perhaps propane or butane heating sources are best. After building a quality still the other of the first two important parts of making your own essential oils is your plant material. If you are harvesting your own plant material then you are obviously far from a novice and probably would not be reading this anyway. However, if you are getting your plant material from someone, the best thing to do is to learn as much about the plant as possible: how it looks, smells, feels and tastes. You will need to know as much as possible about every aspect of your plant to insure you are getting the best quality plant possible. Find out how is the best way to take your plant from the soil. You will be using the whole plant—bark, stems, roots, flowers, seeds, wood—everything. Next you will properly dry the plant material, again, with knowledge of the optimum conditions for the plant and the yield of oil from the plant material. Place the plant material in the still as tightly as possible without breaking or damaging the plant material then fill the bottom part of the still with clean water that has been filtered or distilled then light the fire or turn on the heat and bring the water to a boil. The process should take about six hours, depending on the amount of plant material. Keep an eye on the still, although you should not have to really do anything. Make sure you do not run out of water. And make sure the water is just below the grate that the plant material rests on. Once the oil has separated from the water vapor, filter the oil with an appropriate filtering material and store the oil in dark colored glass bottles for later use or to be sold. Micro-filtering is best. As mentioned above, the water which was condensed from the tubes is called hydrosol. It is also called hydrolate or herbal distillate. But the term plant water essence is perhaps the most accurately descriptive. Depending on the plant material it came from (meaning how fragrant) the plant water essence can also be sold. Make sure you properly filter the plant water essence and store it, preferably also in dark colored glass jars. Non-fragrant smelling plant water essence would not necessarily have a market, but you may want to do some research because you never know if it has a use. Nothing should go to waste. Practice makes perfect, as they say. Enjoy the process. Oils imbued with a loving care will develop a quality that is unmistakable and impress the user and make the experience with the oil you’ve made, enjoyable and cherished.